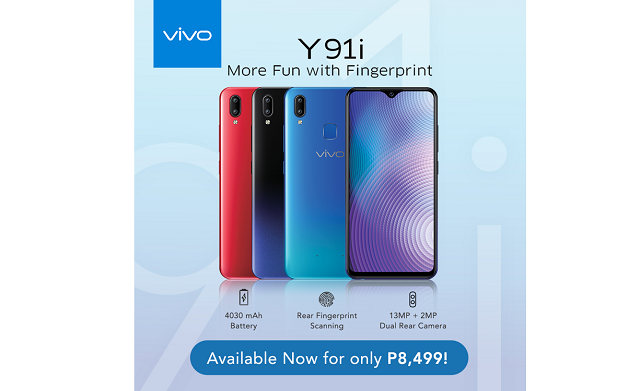 Vivo Y91i now official at Php 8,499. Vivo Y91i has been quietly released by the company after its older brethren, Y95 and Y91. It's a mid-range smartphone with 6.22-inch Halo FullView display with 88% screen-to-body ratio, and 1.95-GHz octa-core CPU. What's even more appealing about this handset is that it is only priced at Php 8,499. The Vivo Y91i crunches a 4030 mAh battery making it one of Vivo's most reliable smartphones in the mid-tier category. It also sports a dual-camera module (13MP + 2MP) which is capable of Bokeh shots. In terms of the selfie game, the handset packs an 8MP front camera which, according to Vivo, captures more details and is backed-up with AI Algorithm that detects user's gender, age, skin tone and even lighting environment. The Vivo Y91i employs a rear-mounted fingerprint sensor for faster unlocking and security purposes. Likewise, the handset is also pleasing in the eyes with its three dazzling color variants: Starry Black, Aurora and Ocean Blue. The Vivo Y91i completes the trio of the recently-released smartphones from Y-series together with the Y95 and Y91.